With so many different brands and options available it can be difficult to know where to begin. That's why I've created this ultimate guide to buying a pole, to take you by the hand and lead you to your perfect pole. The first thing you'll be wondering if you're new to pole shopping is who are the big brands? Who can I trust with my safety as I perform my gravity defying feats of strength? Lil' Mynx, RPole, Platinum Stages, Lupit Pole and my personal choice of pole that I use on a daily basis at home - X-Pole. 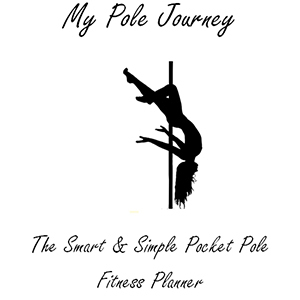 I'll be going through the details of the width and style of pole from some of these great brands with you along the way, along with the pros and cons of the different materials step by step! One thing I want to cover up front is the danger of purchasing a cheap, unbranded or toy pole. You should never trade your safety for a cheaper pole. While this will be one of the most expensive investments you make in your pole journey it will be worth it in the long run, both for your safety and the lasting quality of the pole you buy. Always remember, if a pole seems too cheap to be true - it probably is. You'll probably end up paying more in the long run to replace or repair your pole. I'll also be covering all of the due diligence checks you should be performing before you even think about installing your pole, just incase you do take a chance on a cheaper pole. You might be feeling a bit confused about which type of pole to choose which is completely normal at this point. There are quite a few different materials that your pole can be made out of. So, to get the right one for the job it's important to know what you want to get out of it. If you are just starting out it's often recommended that you try a static (not spinning) 50mm chrome pole. While it's great to start with those in a studio where you can change poles as you level up, it's not so great when you have to sell it on and get a new one to advance. Static poles (like the X-Pole Sport) are just that, completely stationary and do not spin, whereas a spinning pole (like the X-Pole X-Pert) will give you both static and spinning functions. Many people also move on to 45mm poles as they progress, so this size might be a better starting point. That is, if you don’t want to end up trying to sell your pole on to buy another. I’d first like to mention that the standard competition poles are usually 45mm chrome and will be a mix of spinning and static. So if you ever have a mind to compete then this is the best size and material to train on. So with that said lets get down to the different materials and their features! The slippiest of all the materials that you could choose for your pole, stainless steel is great for sensitive skin. Anyone with a nickel allergy will benefit from having a stainless steel pole as the allergy is often triggered by chrome poles. It's also weather resistant so if the only place you have space for your pole is outdoors then this could be a good choice for you. As I said earlier chrome is the chosen material for most competition poles and it's also the most popular choice in the pole community. It gives a regular grip and can be considered quite slippy by some, so perhaps this isn't the one for you if you never want to compete. These poles are made of solid polished brass and have a high grip. The favourite and most common choice for people who struggle with grip. These poles are not solid gold. Electronically coated these poles have still more grip than the brass although for studio use the coating seems to wear off quite quickly. The coating would more than likely last longer with home use. Powder coated poles are great for sensitive skin and provide maximum grip. I tried out the powder coated X-Stage at UKPPC and I have to say it's very cleverly designed. It was perfect on the hands for spinning on static mode while giving super grip for the body. What was perhaps the only down side is that it felt quite slippy on my hands in a handspring scenario – but that could just be me. Silicone poles are similar to a Chinese pole which means they have maximum grip and it's recommended that you use them fully clothed. Going bare skin on these poles can cause nasty friction burns. The silicone coating is not a sleeve, it can't be removed and you should avoid spinning on static mode to avoid those friction burns I was talking about. With the pole set to its spinning function though, the pole can be used for some beautiful spinning moves with the most grip possible. This pole could be perfect for you if you don't ever want to compete, don't like exposing your skin or if you struggle with grip. You'll stick like glue with this one! Being the most popular company to get your pole, all the features I have just described are from various X-Poles. Most other brands use stainless steel poles as far as I can see apart from Lil' Mynx who also offer a selection of coloured one-piece steel poles that are powder coated. To Spin Or Not To Spin, That Is The Question! 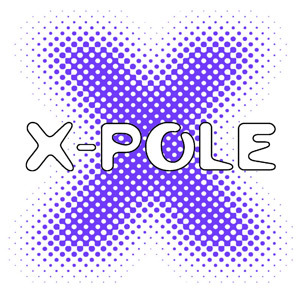 The two main types of pole for sale at X-Pole are 'Sport' which is a static only, stationary pole and 'X-Pert' which has both a spinning function and the option to lock it in static mode with a screw and a hex key. Lil' Mynx have the regular 'Dance Pole' which is static and a 'Rotator Dance Pole' which can change from spin to static in just a push of a button. RPole currently only have one type of pole on the site which is a freestanding stage style pole and mentions nothing about a spinning function. Platinum Stages have a selection of poles with both spin and static functions which all come in either stainless steel or brass. Except their Platinum Glow Pole v2.0 which is an acrylic shell reinforced with a metal rod. The new and innovative fast Locking system from Lupit Pole really simplifies the experience of swapping between static and spin pole with ease. There are no hex keys, just a twist of the locking ring on the lower bearing system! So back to the spinning debate, if you are new to pole you definitely want to start with static. Spinning pole requires a lot more muscle and it's better to wait until you feel more confident and have built up a bit of strength to try it out. That said, you don't want to be buying a new pole when you want to try out spinning and most if not all spinning poles have a static function too. If you've started to look at any of these different poles you might have noticed that there are many different thicknesses to choose from. The smallest width of pole I have seen. This size is only available via RPole and Platinum Stages and could be great for you if you have super tiny hands. Probably best for spins this small surface area could cause armpit, thigh and knee holds to be quite uncomfortable. This is the smallest width of X-Pole you will find. It's fantastic for people with small hands but will make things like thigh and armpit holds more painful as you have much less surface area of pole to stick to. Only available via RPole and Lupit Pole, I've heard good things about the 42mm diameter pole. It's ideal for people who find 45mm just a little bit too wide but want to avoid those armpit and thigh ouchies I mentioned earlier. Don't forget though, RPole only offer a freestanding stage style pole in stainless steel so if you're looking for a 42mm removable pole you should check out Lupit Pole - USA Online Store / Europe & The Rest Of The World. This size is the most popular, not too big and not too small it’s much better for hand grip. It isn’t bad at all for thigh holds as I mentioned earlier, but if you swap to this from a 50mm you might feel the burn a little more to begin with. 45mm is also the standard size used within the industry and in most competitions, so it is ideal to train on if you are looking to compete. This diameter will only be found on silicone coated poles. This is because it is a 40mm pole which increases in size to 48mm with the silicone coating. This is the original pole size and mostly suited to people learning thigh and armpit holds (or any other manner of ouchy areas). It's not always ideal for hand grip and many people prefer a smaller width. That means they often end up selling these poles on to downsize after a while. This diameter much like the 48mm can only be found on X-Pole's silicone coated poles. It is a 45mm pole which increases to 53mm with the silicone coating. With the 50mm feeling so wide on the hands I can't imagine this one being comfortable but it's also not ideal for spinning due to its coating anyway. Perhaps the increased grip on this pole makes up for the wider size. If you have any experience with this size pole do let me know in the comments! When choosing your first pole there's always one question at the forefront of your mind. Is this going to damage my ceiling and how do I avoid that? Will I have to tell my landlord and get permission to put my pole up because of ceiling damage? There’s always going to be some sign of a pole having been in place. The good news is that doesn't mean there aren't ways to avoid it! I’ll go into some of those ways in a bit more detail later on when I go through the basics of putting up your pole. First though, I’m going to take you through each type of pole available. We'll also run through what effect (if any) each one is likely to have on your ceiling. Permanent poles are secured by a permanent mount that you fix with four screws directly into a beam in your ceiling. While some people prefer not to do this it’s actually quite easy to fill these holes and paint over them if you do ever decide to take your pole down. It can actually be much easier than repairing accidental damage caused by the pressure of a removable pole. What's great about these is that you can purchase mounts from both X-Pole and Lil' Mynx that will allow you to install your pole on a slanted or vaulted ceiling. So if you've been dying to get a pole at home but have been cursing your lack of flat ceilings then this could be just the answer you're looking for! By far the most common choice among pole dancers is the removable pole. This is secured by putting in place, extending in length and using pressure between the floor and the ceiling. No screws required. This is also the type of pole I have installed in my home. Through my own trial and error I’ve come up with some top tips to avoid ceiling damage with these which I'll go through later on. These poles are great if you need to take your pole down a lot when you aren't practising, or just to avoid shocking the grandparents or in-laws when they visit. The biggest problem people have with these poles is cracking in the ceiling. At best you can expect a circular ring mark to be left behind when you take it down. It is important to understand when purchasing a pole like this that no matter what tips you use to avoid ceiling damage you risk leaving a slight mark, dent or even a crack in the ceiling. X-Pole have been developing ideas over time to increase not only the safety aspect of their poles but the ease of installation. To make it easier for you to install your pole alone without any help they have developed their bottom loading poles. This means that you will no longer need a ladder to put up your pole. A bottom loading pole will make it easy for you to adjust the height and pressure you need to lock your pole into place completely from the floor! As with bottom loading poles, X-Joints are exclusive to X-Pole. The joints of your pole are the main point of weakness. One of the main causes of poles falling down is weak joints made with thin metal or small, short threads to lock two pieces of the pole together. That’s why X-Pole have developed X-Joint technology. This means their joints no longer have short threads that screw into place at the joint. Instead they use longer metal tubes that expand and contract to hold pieces of the pole together. This gives you increased joint stability as well as taking away the risk of thread wear or joints getting stuck. When buying a second hand pole, it’s important to remember that this is fairly new technology and that older models of X-Pole do have threads. Stage poles are great for a number of reasons. So, if you have a higher budget and enough space for it, you can get one of these from RPole, Platinum Stages or X-Pole. If your pole space is inside the house and your ceiling is lower than 10 feet you would need to buy shorter extensions. Even so, a stage is great for giving you the freedom to put it up literally anywhere, regardless of your ceiling situation. The main benefit of a stage is that there’s no need to worry about it damaging your ceiling. You'll also have the ability to transport it to great locations for photo shoots! If freedom of location is the main reason that you choose a freestanding pole then you’ll be happy to know that the lightest and most portable stage available is the X-Stage Lite. I had a play on these beauties at UKPPC in November. I have to say, I was thoroughly impressed and they are available in chrome, brass, silicone and stainless steel. You can also select a powder coated insert pole on the Australian X-Pole site if you're ordering from there. If you would like to go lighter still the RPole is the lightest free-standing pole, although it is a little more expensive and doesn't come with a stage platform to dance on. There is the option to purchase a crash mat to cover the legs at the base if you choose. Warning: Poles To Avoid Like The Plague! If you’ve ever watched a fail compilation that included a pole falling down with someone on it please take note. Avoid these poles if you want to avoid being that person. "Toy" poles from shops like Ann Summers are not for pole fitness, pole sport or any kind of extreme pole dancing. They are extremely dangerous for any use other than walking or dancing around it looking pretty. While there are a lot of poles like this out there, a couple of examples are the Carmen Electra 'Professional' and 'Peekaboo' Pole Dancing Kits. Poles like this can be deceptive in that they look sturdy to the untrained eye right up until they come crashing down with you on them! This is largely due to them being made of very low quality metal with lots of plastic parts, a trait shared by many cheap poles. You can even find petitions online that are fighting to have these dangerous and misleading poles removed from sale because they are not fit for use. So please be advised, these poles are not equipped to take your weight. If you try to swing around or invert on one of them there’s a high risk that it will fall down. Thinking about buying second hand? Then there's another thing you need to watch out for. Occasionally someone will buy a pole, whether from Ebay, GumTree or some other unverified seller, and it turns out to be fake. To be sure you are getting the exact product that you’re paying for you should always buy directly from the company. 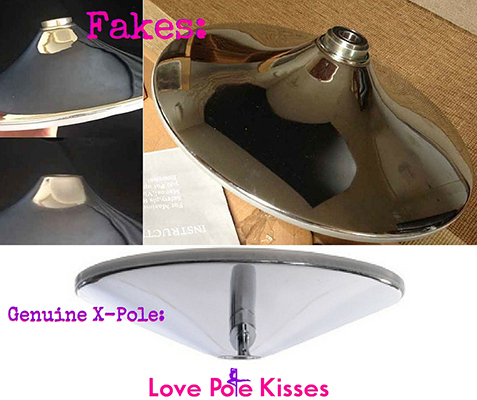 You can see more details about how to tell the difference between a real X-Pole and their fake counterparts here. As you can see there are a lot of cheap no brand or toy brand poles to watch out for along with fakes of our trusted brands too. So, when you’re faced with a cheap alternative that looks just like that X-Pole you want, it’s tempting to go ahead and save yourself some money right? That’s why in this section, I’m going to cover the things you should look out for that can identify an unsafe pole. Whether you do happen to buy a cheap or no brand pole, or are just unsure whether your pole is genuine and the seller trustworthy. Should you ever find yourself in doubt here’s a handy checklist of things to look out for from top to bottom on your pole. The rubber around the dome and base plate of your pole should be slightly soft and not too hard. Rubber that is too hard will be prone to sliding while the softer rubber grips tight to your floor and ceiling. An easy way to check if your rubber is grippy enough is to place the dome and/or base plate on a flat surface and give it a push. When you press down and try to slide it at the same time you should feel the resistance the rubber provides. If at this point your dome is sliding around all over the place, this rubber is too hard. Another unstable feature on some cheap poles is the teardrop shaped dome. This has been known to break at the weaker point of the dome where it drops down in the center in some cases. It's also a feature of fake X-Poles that have been spotted as shown in the picture above. Rather than the shape of the dome being the issue with these as I first thought, it turns out that some of these domes were in fact made of plastic. This is what caused them to be unstable and break. When looking at the quality of your pole one of the tell tale signs you have a dangerous pole is thin metal. This can be difficult to spot if you're buying your first pole but if you look down the center of the pieces of your pole the metal should be fairly thick. Thin metal will bend easily with use and bending is one of the main reasons poles fall down. This is because the bending reduces the pressure between the floor and ceiling that is holding your pole in place. Another problem with the metal on cheaper poles is the problem of chipping or sharp edges around the joints which can lead to some nasty cuts. So check the edges around your joints carefully too. The joints of a pole are its weakest part, which is why it's important to ensure the joints of any pole are up to standard. Remember that X-Joint technology we talked about earlier? If you buy a new X-Pole it will come with this X-Joint technology, so any new X-Poles with threads you come across are most definitely fake. With that said, some of the older models are made with threads. So what you should look out for to identify solid threads is that they are not too short. Threads should be fairly long and screw firmly into your pole. The picture above is from an original first version of the X-Pole. These are still safe although X-Pole have worked a lot on developing the technology behind their poles to further ensure our safety during use. I would consider anything smaller than this to be dangerous and a sign of weak joints, which can lead to the pieces of your pole literally snapping apart. Another common attribute of cheap poles is that they contain lots of plastic parts.I believe the Carmen Electra one I mentioned earlier even has plastic threads - yikes! Plastic parts are a huge risk to your safety on a pole, they break easily and aren't made to withstand your weight. Some pole manufacturers will include plastic parts which are shiny and silver and look remarkably like metal. Sneaky huh! So that's something else to watch out for. The adjuster cover is a thin hollow metal tube that slips over your pole and covers the part you extend to secure the pressure between your pole and the ceiling. The cover and ring that come with it should be checked carefully when purchasing cheap or no brand poles. The first thing to watch out for is that the cover is secured using screws and doesn't simply slot over two pop out buttons. The reason for that is that those pop out buttons are flimsy and will shift the moment you put any amount of weight on them. That's not what you want when you're at the top of your pole. The last thing you need is to grab hold of your adjuster cover only for it to come loose and send you plummeting back down to the ground. So first things first, make sure your adjuster cover has screws! The other thing to check with these is that they are in fact metal. As I mentioned previously some manufacturers will send these parts out looking like metal but they are actually plastic. In that case, screws or no screws the plastic is going to give out at some point and break, sending you once again straight down to the floor. Last but not least it's important to note that cheap poles can also seem just fine at first but will wear quickly. Long term problems like the metal chipping and cutting you or the pole bending and falling down are common. What would be safer and save you money on replacing low quality poles in the long run would be to always buy from trusted sellers. Don't go cheap - your safety is worth far more than that and you should never compromise. If you're not sure if the brand you have found is trust worthy, feel free to ask me here. Or if you are a member of a pole community or forum, just ask there to see if it is known. It seems silly to write a guide to poles without including some of the most epic poles I've seen along the way. The 'Glow Pole' by Platinum Stages is the only light up pole suitable to be danced on. 50mm in diameter, the material is an acrylic shell reinforced by a metal rod. This pole can be custom cut for any ceiling height up to 12'. It's not 'removable' and requires 4 screws in the ceiling and 3-4 in the floor. The 'glow' feature is created by LED lights in the ceiling and floor mounts which can be operated with a control box. The control box allows you to either set a single colour or have your pole flash through a sequence of colours. You also have the option to change colours to a music beat using sound sensitive technology. Platinum Stages are at it again, this time with the super cool new Hitch Pole! The Hitch Pole is designed to be attached to the ball hitch of any SUV or truck. In the style of a stage pole, the Hitch has a 3' x 3' platform and has around 7' of usable pole available in either 45 or 50mm diameter. The stage varies in height from the ground depending on the height of your vehicle and is available in either Stainless Steel or Brass. The stage and frame of the Hitch Pole is made of the finest quality steel allowing it to support up to 200lbs. The pole also breaks down into two manageable pieces allowing it to fit in any car. Lil' Mynx have a selection of Wake Poles that are perfect for just that! You can find them in the drop down menu under Dance Poles & Accessories. With the choice of either stainless steel or powder coated, imagine the fun you could have with your pole installed on your boat! The design of the wake pole accommodates most ski boats with V-drive or I/O engine setup. As long as there is an open area under your wake tower Lil' Mynx has got you covered! The poles boast an easy set up, are completely removable, stable at speed and each pole is custom cut to fit the size of the boat. The one piece pole is available in black, pink and red and you'll need to get the measurements from tower to hull before you order. They even have an optional bottom for this pole available to buy so you can also use it at home! It's not just pole either! There's a tonne of fun to be had in the Aerial Arts space and having never tried anything other than pole until recently I was pleasantly surprised. Compatible with 40 and 45mm X-Stage or X-Pert is the new Silkii by X-Pole! This allows you to attach aerial silks to your pole and incorporate both pole and silks into your performances. The silks are also great for self spotting in new moves. Another thing Silkii is great for is extra support with more advanced tricks! To my pole - sorry I'm not sorry, I hope you can forgive me! Seriously though, I took to the hoop like a fish to water with the strength I've built from pole. These are available in many hoop sizes and hand widths on the X-Pole website. You have the option of either single or double points, single allows you more freedom to spin and perform moves. I was really looking forward to trying out Aerial Silks at this year's UKPPC but unfortunately this year they decided to put up more poles instead! I'm still eager to try it though and you can find portable aerial rigs and silks at Aerial Essentials if it's something you'd like to try. As I mentioned earlier there are a couple of tricks to avoiding the marks in your ceiling from removable poles. We'll touch on that in just a second as we briefly run through the safe installation of a removable pole. First you'll need to find 2 beams or studs using a stud detector. Some instructions and manuals for pole installation will tell you to tap across the ceiling until you hear dull thuds instead of hollow knocks. If you can find yours using this technique that's great. In my house the sound was no different and I had to use a stud detector. I would say this is the most accurate method to ensure you are definitely not missing your beams too. Step two is to measure your ceiling height using the tape measure. Using the guide or height chart that should have come with your pole, select the attachments shown for your ceiling height. These poles have a 12 inch range of adjustment from 8-9' or 9-10'. Depending on the height you choose the main body of the pole is a little under 8 or 9 feet and custom options are available. For example, if you needed a pole less than 8' you could choose the 8-9' pole and specify your ceiling height when you order, with no additional cutting fees. Next, once you have put together the correct attachments, put your pole in position directly between your chosen two beams. Each side of the dome should just overlap each beam. Use a spirit level to check the pole is straight before you begin to tighten. The clear bubble should be right in the center of the two lines you see. Don't forget to check this 360 degrees, all the way around your pole, as one side could be leaning slightly while the other is perfectly straight! Depending on which pole you have, you may need help keeping the pole steady and in place while you tighten it. If you have a bottom loading pole this shouldn't be a problem but for top loading poles you will need a ladder as you will tighten your pole from the top. A magnetic spirit level will help if you don't have someone to help you and you're working with a top loading pole. That way you can get your pole in position from the ground so that you know everything is straight, then climb your ladder and re-align your pole back into place. Once in place this leaves both hands free to tighten the pole at the top while still keeping an eye on that bubble and making sure everything is lined up nice and straight. I used to have trouble when putting my pole up and down, remembering which way to turn it to extend it. That resulted in me cracking my ceiling one day as I tightened it further instead of unscrewing it. So if you have this problem here's a little saying that helped me to remember: "lefty loosey, righty tighty"! I'll never forget that since I heard it and I often put it to use when putting up my pole. Your pole will need to be nice and tight to avoid it falling down and causing any damage or worse, injury. Some people are worried that over tightening their pole will cause ceiling damage. While this is true you shouldn't leave your pole too loose. I learned that the hard way when my pole came down with me on it in a fireman spin the first week I had it! In it's current place in my house my pole has caused no ceiling damage but is nice and tight. DO make sure you get it perfectly between those beams. If you are slightly off the pole will probably crack your ceiling a little. DON'T forget to ensure your pole is perfectly straight. Uneven pressure can lead to ceiling damage and also mishaps such as the pole falling down! DON'T over tighten your pole. Aside from ceiling damage, the extra pressure on your pole can cause it to bow which is one cause of poles becoming unstable and falling down. I constantly put mine up and take it down in different spots and depending where I put it and how tight it is secured affects the ceiling differently every time. At best though it always left a circular mark. Although I've never tried it myself, a common way to avoid this circular mark is to put something as simple as a tea towel between the dome of the pole and the ceiling. When tightening the pole I usually tighten as far as possible but slowly and carefully until I hear a slight shift, creak or lift in the ceiling. You'll probably feel that it is harder to extend your pole further at this point too. That's when I stop to avoid damaging the ceiling from too much pressure. This should leave your pole tight enough for safe practise but not so tight as to damage your ceiling. Once your pole is up you should hold it with one hand and lean with your full body weight to the side to check for any stability issues and slipping. I tend to walk full circle around my pole in this way. If you are happy at this point then you can try a basic spin, again watching for any slippage or movement. Now your pole should be ready for play, happy poling! Is there something I haven't covered here? If you have any questions at all just let me know in the comments below! Where was this guide when I bought my pole 🙁 Haha. I bought my pole from Amazon last September. It’s been pretty good so far, it wasn’t a name brand, but it was on sale and got good reviews. Looking at this guide, it has the wrong type of dome, and has caused some minimal damage to the ceiling. I can’t unscrew the parts anymore either. However, it’s never shifted or given me any reason not to trust it: even in spin mode (though the beatings are squeaky so I don’t spin that often). Since I’m in college, I can’t really afford to buy a better one yet. Do you think I can hold out another year until next June when I’m done with school and have a real job to afford a real pole? Or should I put away some internship money and buy a better one asap? Since you already bought it I would just continue with your plan to upgrade when you can afford it if it’s not causing you any problems and put aside what you can, just keep an eye out for the dangerous adjuster covers (if it has them I would just take them off) and check if there are any plastic parts at all as that is the most dangerous factor. It’s is a mega brand! Awesome glad I don’t have to worry! Sure thing, I’ll come back to this post with the one I buy!! I wouldn’t say you have nothing at all to worry about exactly, just that I’ve heard from people who were happy with it. Hey Taissa, I just wanted to check back with you as I have some updated info in the article about the tear drop shaped domes and a very easy way to check if it is safe. I first thought it was the width of the dome where it drops down that made it unstable but it turns out that some of these domes were in fact made of plastic which is what caused them to break. Can’t buy a pole for my home yet (ceiling problems and a stage is just unaffordable for me right now) but will definitely pin this to remember to check it when I do buy! And my intuition to go with X-Pole and 45mm is confirmed! What problems have you found with your ceiling? We just moved house and it was so frustrating, needing flat ceilings for the pole ruled out a bunch of nice houses around here haha! It depends what you want out of it, if you want to dissassemble to move it for pictures or outdoor pole then it’s easier to be able to take it apart. If your ceiling is less than 10ft you might want to check the height on a one piece (which brand were you thinking of?). X-pole for example have a smaller extension for the top section if you need it slightly lower. Nice guide! Just wondering is there any way to install a aerial hoop or silk to a permanent pole mount lie those of x-pole? I don’t think it’s possible to attach a hoop to that but in all honesty I’ve never tried. The only hoop I have used was on an A-frame like this. 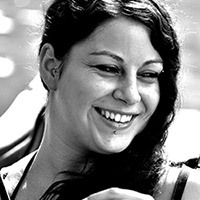 For Aerial hoop installment you need rigging like these at Aerial Essentials. Thanks for the great article and advice, this is very very helpful. I’m weighing up my choices between a lupit pole (42mm) and an Xpole (powder coated in black but its 40mm). My current studio has the really big 50mm poles and I struggle a lot with my small hands to get a good grip. I competed this year and fell in love with the lupit pole I was on so have been stalking them for a while. I’ve also heard that Xpoles can pinch you sometimes? I don’t want to go too small in the pole diameter otherwise I think I may suffer, so I’m really hoping that the lupit pole is a good choice! I’m also looking to expand on my spinning technique, and i suffer quite a bit from sweat (I’m that girl that uses all the tac and grip in the world) and I know buying a pole is expensive, so I just want to make doubly sure! No problem at all I’m glad you found it helpful! I think most people have problems with a 50mm width to be honest I know I prefer 45mm, although they will help your grip strength lots. Is there a reason you haven’t considered your powder coated option in 45mm? Not all competitions use Lupit pole and the standard is usually 45mm, so if competing is something you want to carry on doing it would be good to be familiar with the width, but then powder coated is going to be much grippier than chrome (the standard) too. If you suffer with sweat (I do too!) then it really depends on what you want to get out of training. I prefer to stick with chrome 45s and figure my body out and get used to it, because I’d like to compete someday too and I wouldn’t want to get used to a grippier pole. They also have a cool grip towel you can buy where one side is for use on the pole and the other side for you, I’m going to try that out in January! For help with your grip problem you can check out this article too. I hope some of that helps make your decision easier! I had a pole similar to the mega brand pole mentioned above. It had all metal parts but just wasn’t as nice as the X poles in the studio I go to. My instructor advised me to get an X pole and I’m glad I did. The spin function is so much smoother. The finish of the whole product is so much better: On my old pole the chrome had worn off on certain spots after only five months of (intense) use. Yes I agree, my old original (first generation) x-pole is still going strong haha! I’m looking to purchase a pole and was wondering if you could advise me if the company ‘Platinum Poles’ is a good company to buy from please. I haven’t heard any direct reviews from people who purchased from Platinum Poles so I wouldn’t like to say, just be sure not to confuse them with Platinum Stages, two very different companies!